Duchess Kate: Sunday Service at Crathie Kirk & The Queen Drives Kate and Carole Around Balmoral! Sunday Service at Crathie Kirk & The Queen Drives Kate and Carole Around Balmoral! As expected, the Duke and Duchess of Cambridge have made their annual sojourn to Balmoral, taking Prince George and Princess Charlotte to the royals' Scottish retreat to spend time with the Queen and Prince Philip before the summer closes. Kate's parents Michael and Carole Middleton also joined the group. They reportedly arrived on Thursday and will only be staying for several days as Prince William has an engagement in Battersea on Wednesday. This morning, the couple - styled the Earl and Countess of Strathearn in Scotland - were photographed arriving for Sunday service at nearby Crathie Kirk. Also in attendance were the Queen and Prince Philip, Prince Charles and the Duchess of Cornwall and the Middletons. (You can view photos at the Mail Online, we will update should they become available to license). 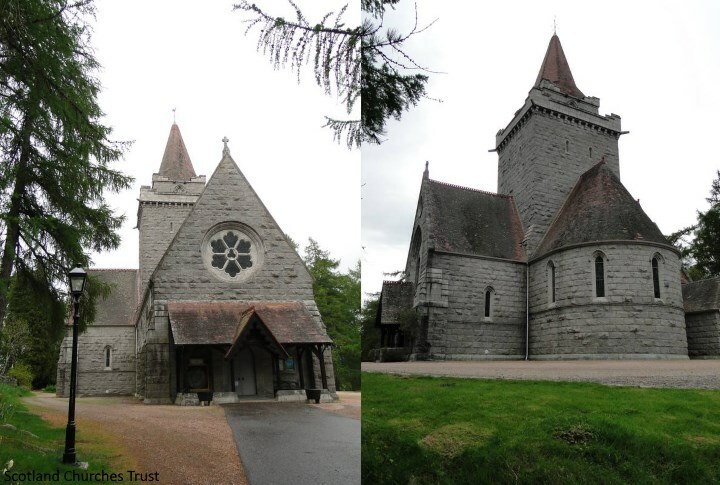 Crathie Kirk is a small Church of Scotland parish church in the village of Crathie. The walls are built of local granite and the roof made of Scots Pine. Building materials were donated by the surrounding estates, and £5000 raised by the local population to fund construction. It is known as a regular place of worship for the British Royal family when they are staying in nearby Balmoral. The Princess Royal married her second husband, Timothy Laurence, at the church because she was divorced and, at the time, not permitted to marry in the Church of England. Queen Victoria donated two stained glass windows which commemorate author and social reformer Reverend Norman MacLeod, and endowed the kirk's Father Willis organ. Victoria's highland servant John Brown is buried in the churchyard. Princess Beatrice (later Princess Henry of Battenberg) donated four bells which continue to hang in the bell tower. Edward VII donated two marble medallions commemorating his brother Alfred, Duke of Saxe-Coburg and Gotha and sister Victoria, Princess Royal and Empress Frederick. Edward's son George V donated a communion table dedicated to the memory of his father. This was made from white marble quarried on the island of Iona, the site of Columba's monastery. Elizabeth II donated a Bible decorated with the Royal Coat of Arms. It appears the Duchess wore her Michael Kors skirt suit this morning. A recap on the details: the slate/claret Virgin Wool Plaid Blazer is described as a "vintage-inspired equestrian silhouette" with notched lapels, long sleeves, four-button closure and plaid knit print. The piece originally retailed for £1000. Once again, Kate wore a black top underneath. The Guncheck Wool Trumpet Skirt is crafted from heritage guncheck wool with the trumpet silhouette offering a flattering feminine fit. 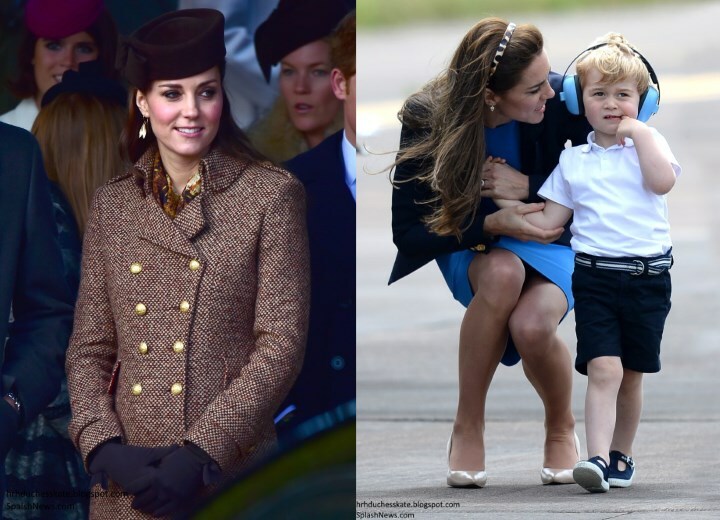 Kate also wore a new burgundy hat and what may be her sapphire and diamond earrings. Yesterday, Her Majesty took the wheel as she drove Kate to a picnic lunch. There is so much I love about this photo, and it's lovely to observe the closeness of the Queen with her granddaughter-in-law. It's clear they have much in common and have likely bonded over their love of country life. In ITV's documentary Our Queen at 90 Kate remarked: "I suppose what's really struck me is her love for the simple things in life. You would expect a lot of grandeur and a lot of fuss, but actually what really resonates with me is her love for the simple things, the lack of fuss, and I think that's a special quality to have." It's simply wonderful to see the Queen, at 90, completely in her element driving herself about with a protection officer sitting in the back. We see few glimpses into the royals' private lives and this is a lovely snapshot to see. You can view more photos here. There's also a photo of the Queen driving Carole on Saturday. Again, it's excellent to observe the closeness between both sides of the family. Carole and Michael reportedly arrived on Thursday night. There are more photos available here. The royals had their lunch in the hills above Loch Muich. The Duchess was casually attired sporting what appears to be a green jacket with a patterned scarf, which several tweeters have noted looks very similar to her Really Wild Autumnal Partridge Scarf worn on Christmas Day 2014 and her Alice band. The Cambridges are reportedly staying at Prince Charles's private residence, Birkhall, and enjoying plenty of fresh air, walks and time with HM and Prince Philip ahead of their first overseas tour as a family of four later this month. 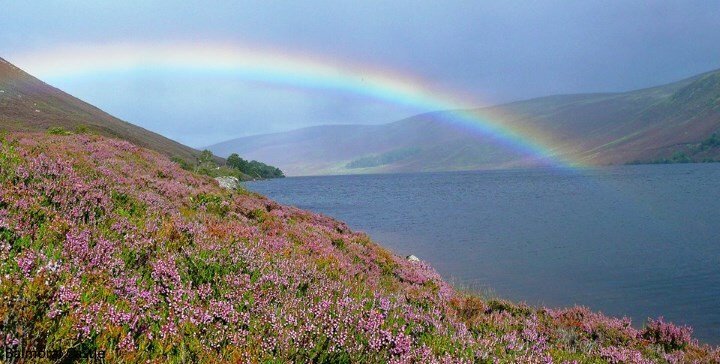 'A "paradise in the Highlands" is what Queen Victoria called Balmoral. 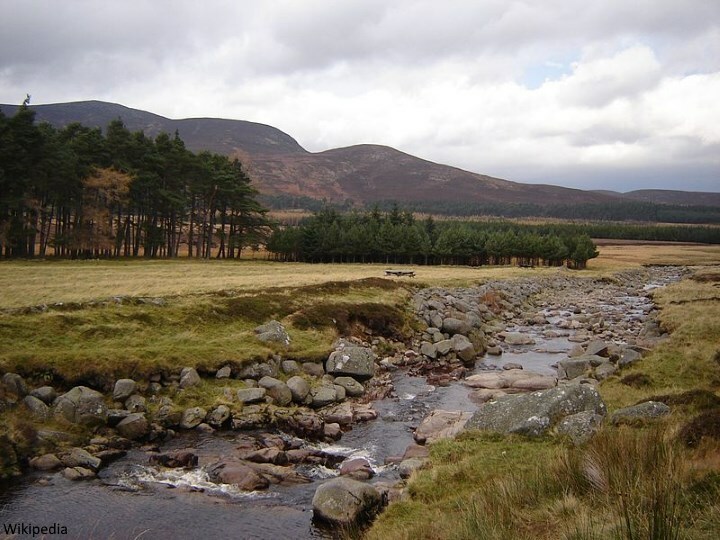 On arriving at the Scottish retreat she famously recalled in her diary: "All seemed to breathe freedom and peace, and to make one forget the world and its sad turmoils." 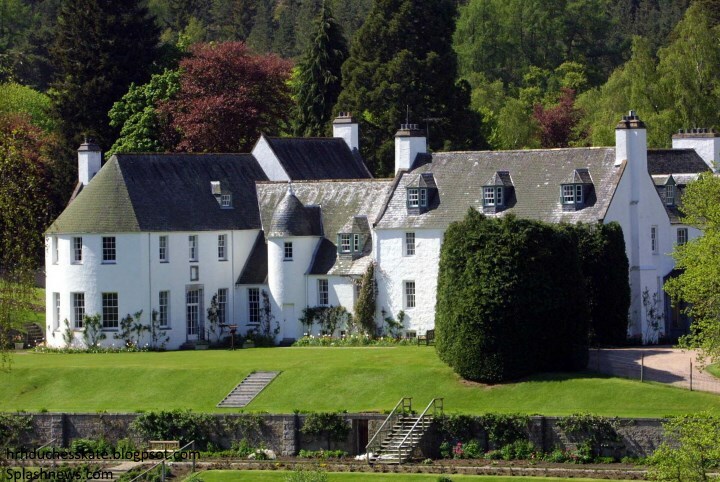 The magnificent estate, set amid mountains, lochs and glens, held a special place for the late monarch – just as it does for the present Queen and her family. Victoria and her husband Prince Albert first visited the Highlands in 1842, and were so struck they resolved to return. 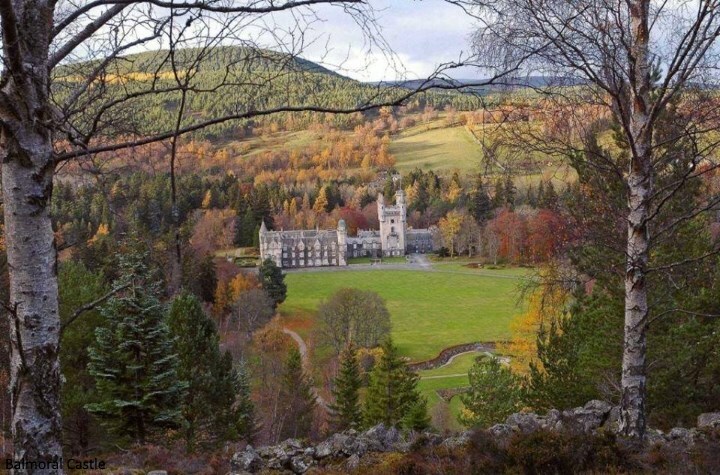 In 1852 Albert formally purchased Balmoral property for his wife. The original house was deemed "small but pretty", which led to the commission of Balmoral Castle. Unlike other properties such as Buckingham Palace, it is privately owned. Princess Eugenie described Balmoral as "the most beautiful place on earth. I think Granny is the most happy there. I think she really, really loves the Highlands. Why? Walks, picnics, dogs – a lot of dogs, there are always dogs – and people coming in and out all the time. It’s a lovely base for Granny and Grandpa, for us to come and see them up there; where you just have room to breathe and run". With views like this, it's no surprise it remains a firm favourite. We expect the tour itinerary will be released within a couple of days. See you all then! Love love LOVE this!!! Awesome, and historical in some ways, photo!! Great post with all the info! Don't think she wears a coat for a picnic in the Highlands. More something like she wore for her snowy Scouts visit when pregnant wir PG. Jacket/jumper jeans and boots. That photo is one for the history books for sure. What a sweet revelation of the Queen's vitality and generousity of spirit. A real, warm and loving woman. As a future Queen, every minute that Kate can spend with the current Queen is quite invaluable on many levels. Kate being driven around at Balmoral by the Queen. Amazing. And, going on a picnic to boot. How fun is that. There is an article somewhere that talks about how William used to often take Kate to Tamna-Gar, as Charlotte mentioned, and about how he had quite a lot of renovations made to the cottage just for Kate, including having a Jacuzzi installed there. Pippa, reportedly, would sometimes accompany them there also. I would love to see the decor of the cottage. And, having her parents as house guests of the Queen adds to that, plus having the Queen drive Carole home from the grouse shoot. William and Kate were staying with Charles and Camilla, so Michael and Carole were on their own with the Queen and Prince Phillip. How could anyone relax in that situation? Some of the Balmoral cottages can be rented. Not sure whether that is one of them but you can look them up on the Balmoral website and there are photographs. I think the Queen is a pro at putting people at ease and so is Prince Phillip. Michael and Carole have been around aristocracy since Marlborough days and since Kate started dating and then living with William. Since the wedding they have spent substantial time with the Queen and Phillip and with Charles and Camilla and all the inner circles of people therein. Their own daughter will be Queen one day and their grandson King and so on and so on. So, they shouldn't feel like just intermittent guests or interlopers in any way. They belong in the presence of Royality as they are part of it now. Thanks for the post Charlotte! I love post like this. Truthfully, I'm not a big fan of just looking at post about clothes. They are beautiful, but just not my thing. I hope there are pictures of Kate and William at Church. Also I can't want for more info on the tour, hopefully the kids do go! Fingers crossed! Charlotte, I saw a picture of the Queen driving Carole Middleton, it was on the Mirror website. Was this from yesterday as well?? If so, the middletons were at balmoral. To share the awesomeness of this blog and the fun and beauty of our designs, I have emailed the previous page to Kate's parents' business address, hoping the team there will take a look see and enjoy, and, perhaps share the fun with Kate's mom. She might be so impressed with the blog (HOW could she not be) and with our designs that she may even share the fun with her daughter. I included a paragraph or two of introduction so they would be more likely to actually take a look see. So nice to see an easy and comfortable relationship between the queen and Catherine. I hope we get to see more photos, especially if everyone went to church this morning. Why oh why do they never wear seat belts? Even on the estate, a deer could run in front of the car and hopefully the driver could stop suddenly and safely. It's one of my biggest pet peeves. The queen never wears a helmet when riding either -just a scarf usually. http://www.mirror.co.uk/news/uk-news/queen-chauffeurs-kate-middleton-grouse-8813220 Carole was there too! Charlotte, could you perhaps try and verify if Carole Middleton was indeed there? That picture looks like it might be photoshopped. Carole is indeed there. Photos have just surfaced from Sunday Service at Crathie Kirk and the post has been updated. Sophie Carter and Nicholas Von Custem are also there. In the car with Carole Middleton. i didn't know John Brown was buried there. Very interesting royal history. Sophie and Nicholas van Cutsem were never an item. He's married, I think. She went out with Thomas van Straubenzee. But where is lovely Michael??? In the photo of Carole being driven to church that appears in the Daily Mail I can see a dark clad arm. I wonder if Michael is there in the back between Sophie Carter and the other female passenger? I saw this on twitter. Don't know the validity, but I cannot wait to know more about the tour! It's getting really close now! The complete itinerary for the Sept. 24–Oct. 1 #RoyalTour of The Duke & Duchess of Cambridge will be available tomorrow! How lovely to see the Queen, at the wheel, with her family. From the photos it looks as if the Queen and Kate enjoy a close relationship. Also nice to see the Middletons included. Maybe it will silence the tabloids and their rumor mills. Then again, probably not!!! Balmoral looks like a heavenly area. The countryside is breathtaking. Amid the highlands and lochs. Remembering September 11th today here in the United States. It is hard to imagine that 15 years have gone by. I agree, Tedi. It can't have been 15 years already! I've been watching some documentaries with more details about that day. There was so much information to take in that day and the subsequent days, I just now learned that the Sears Tower was also evacuated and President Bush and Condoleezza Rice couldn't get ahold of Donald Rumsfeld because he was helping people evacuate the Pentagon. God Bless! I just re-read Charlotte's post from December 9, 2014. The Memorial is beautiful, peaceful. Given some of the articles we have read about the Middleton's and speculation over their relationship with Charles, I am thrilled to see these photos. This is a loud and clear message from HM about where SHE stands. The Queen leaves no doubt about that. I am concerned that Michael didn't seem to have been in attendance at the grouse shoot or church services. Does anyone else find that strange, particularly since the Queen is their host. He seems to dearly love the Queen so that makes his absence even stranger. Any thoughts on that anyone? Charlotte, do you perhaps know why Michael wasn't at those events? Yes it is. She meant for these pictures to be taken - a photographer did not just "happen" to be lurking around in the grounds of Balmoral. They were obviously given permission, being private grounds. The Maj wanted to give her support loud and clear to the Middletons. I'm so. excited about the Middleton's being invited, royalfan. I was sure that the rumours weren't true, but this proves it. Anonymous 3:11 Michael was reported to have arrived with Carole and also as attending church. I think I might have spotted his arm behind Carole in a going to church photo. 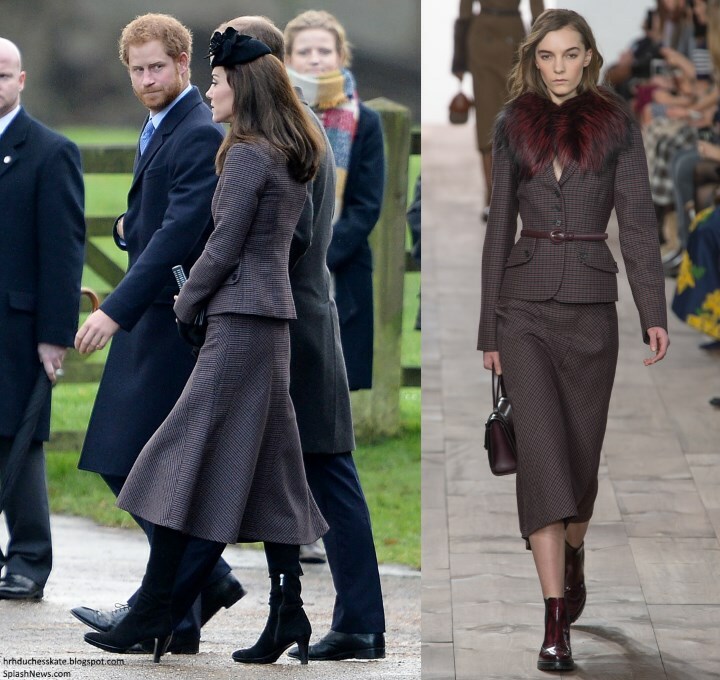 I am not sure about everyone else but I am interpreting these pictures as confirmation that 1. there is indeed a rift between Charles and William with regards to the Middleton's presence in William's life and 2. The Queen is firmly in William's corner and appreciates deeply the way the Middletons have carried themselves. This is exactly the kind of signal of support that the Queen sends out. It is unmistakable. This is all conjecture.. but honestly they have really shown Charles what dignified conduct is. 6:55, I never believed that the Queen had an issue with the Middleton's. And yes, this does prove it. 22:49, I share your opinion. Every bit of it. 22:49, I also agree. And, upon reflection, this photo Journalism was so concise that I believe as you do regarding that. It was an expertly designed, perfectly orchestrated, remedial mini news blitz meant to calm the storm. It is a signature motis operandi of the Queen as you said. And, they have just "shown Charles and Camilla what dignified conduct is". Very aptly put. I pray that the Camilla wasn't the one stirring the pot, whispering in Charle's ear about the Middleton's (very normal) involvement with the children. Heaven knows how close the Queen was with her mom and sister, so Charles should consider that if Camilla starts buzzing in his ear any not-so-sweet nothings. I agree with ya'll that the photos were not happenstance. And as much as the Queen highly esteems Kate and her parents, I think that the Middleton's invitation to stay with the Queen while William and Kate stay at Charle's and Camilla's, was a calculated thing meant to portray solidarity within the monarchy. They also seem to be wanting to learn from mistakes made in the past. The monarchy has to present solidarity. I do wonder whose brilliant campaign this was. Charles spends money on PR and it's like trying to walk DOWN an UP escalator. Meanwhile, HM gets behind the wheel and mission accomplished! So funny, your escalator paragraph. Sublime description. Thanks Charlotte. I am beyond impressed with this post. Lets hope the tabloids keep silent about the relationships between the Queen and the Middletons and the Queen and Catherine. The Queen is such a good example in so many ways of getting her point across without saying a word. I am so looking forward to the Canadian Tour. Remembering September 11 and wishing all a blessed day. Thomas Staubenzee was with William, right? Yes, that does appear to be Thomas. While riding in the car with the Queen, it looks like Kate might have been wearing the Silk Scarf in Autumnal Partridge from Really Wild Clothing, first worn on Christmas 2014.
wow. Kate chauffeured by the Queen. William and Kate and the children house guests of Charles and Camilla. Michael and Carole house guests of the Queen and Prince Phillip. Carole chauffeured by the Queen. Michael and Carole given pride of place on the Royal pew at the church service. A little bit of heaven in the foothills of Scotland today. I am so relieved. So happy the family is doing way better than reported. I was thinking there was a huge gap in PR concerning confirming these healthy family dynamics. Now the gap has been royally filled. Whoever iniated these PR events deserves a raise. "A little bit of heaven in foothills of Scotland today"
is right. And the PR gap "has been royally filled". I was thinking of you Royalfan on 9-11 - remembering you lost a family member. Even fifteen years on, the memory of that day is so strong - it seems like yesterday. My condolences and thoughts to everyone. Lovely article in D.M about some of the children of those lost. And I did read the DM article you refer to here. Very touching indeed. I can't even TAKE Gan-Gan driving. She is so cute, it brings a tear to my eye. Charlotte, just out of curiosity: Is the shot of the river/creek the spot where Queen Elizabeth had a picture taken (I believe by Annie Levowitz) in an Emerald green cape? JUST stunning the area. It certainly appears to be in that area. That was a stunning photo - one for the history books. I would like to see some photos of Charles and Camilla intermingling with William, Kate, George, Charlotte, Michael and Carole. Those are very much needed IMO. if anyone hasn't seen the photos of Princess Eugenie in an August article in Harper's Bazaar, you just HAVE to see them. The photographs are of her royally poised in the most beautiful gown in the sitting room of her home the Royal lodge at Windsor Park. What a room. What a gown. What a photo. The other photographs of her by Harper Bazaar are superlative and show how very beautiful Eugenie is when she is styled properly. You might not recognize her the style is so perfect for her. I SO wish Kate would do a royal pose like that. The Interview is very sweet also. Anon 09:49, you are right, the photos of Princess Eugenie are beautiful!! That gown, that room, Princess Eugenie....wow, wow, wow. Very nicely done and I agree the interview is sweet and enlightening! Two things to know about Princess Eugenie is that she works and has a rod in her back...did not know that. Think that these type of interviews and exposure are important for the royals...makes them more relatable. There seems to be a lot of focus on Princess Eugenie of late. The photos of Eugenie were lovely and I would like to see a similar photo shoot of Kate. But I will say that some of the details shared by Eugenie concerned me (strictly security reasons). I though the same thing, RF. Very specific information. about how different Eugenie looks when she wears outfits that fit her body type and wears clothes that compliment her beauty and don't camouflage it, distract from it and generally make her look frumpy and sometimes clownish. She should absolutely have that Harper's Bizaar stylist on payroll immediately. She is a stunning beauty. Who knew? Eugenie does look like a different person I agree. In those photos she goes from a little girl whose mother always dressed her wrong and she never lost that, to the very, very, va va va room best that Eugenie could ever look and in more than one photo. THAT Eugenie can change the world. I find the photos and lodging accommodations ASTONISHING and such good news. Twenty years ago "the in-laws" would have shown up in the wedding photo at the palace, never to be heard from again basically. Thankfully, things are a lot different now. Autumn is welcomed in and her family included. Same with Sophie. What was going through Carole's mind as she was being chauffeured by the Queen? Can you imagine? Would loved to have seen Michael and Carole's reaction when they received the invitation to spend the weekend with the Queen and Prince Phillip at Balmoral. I was thinking the same thing! What on earth can Carole be thinking? What is she more stunned by? The fact that HM is driving, or that she is being driven by HM? This is such a surreal moment to capture in a photo. So iconic. Love it! Pap photos of Prince George and Maria saying goodbye to Kate and William when they went on their two day tour last week. Also, Kate holding Lupo. It really touched my heart, Carole with the queen and the later driving. At the end of the day, life is beyond status; it is also about our faith and what we value constructively. Carole had been instrumental in the couple's life along with her husband, Michael. Carole had received "the slap, the kick, bullying" by mis leading media which encourages its commenters to beat up on people, and undermining of who she is as a person. This is an excellent image in defense of the union of the marriage/royals and commoners/in laws and families. Smart move, may not be necessarily motivated by PR, but an excellent one which includes that. The belt on the model is positioned at least two inches above her natural waistline. Gives the appearance of a smaller waist.This styling is seen fairly often on designer models. The Queen's coronation was one of the most blinged out events I have yet to see. I am surprised that they didn't need special filters on the camera due to all the vast sparkle. Tiaras galore, who could tally the combined carat weight of all the diamond earrings, necklaces, bracelets and brooches? There were gold threads, silver threads, sparkling gems on the gowns, glistening in the light. HOPEFULLY, Kate being a student of art history and all, she has seen the video of the coronation and that will inspire her in the future to follow suit whenever the occasion even remotely allows. Bling is meant to bling and they have a lot of it. yep. I think we would all be for more bling. It seems to be confirmed that Prince George and Princess Charlotte are joining their parents on their Canadian tour. Yippee!!! I really don't understand all the brou-ha-ha about Charles spending time with the children. Kate would gladly schedule time for him with the children. Kate is loving and kind and enjoys Charles. And I don't think that William would begrudge his father even one second of time with George and Charlotte. He has only to ask, IMO. When the first story about Grandpa Charles vs. the Middleton's came out, I had stated that it COULD have been a very innocent observation on his part and SOMEONE [cough] used the opportunity to stir the pot where W&K (and the Middleton's) are concerned. ON THE OTHER HAND, if Charles truly views the Middleton's as a pebble in his shoe, then he fails to understand how HIS own actions have contributed to William's bond with Kate's family. AND he is not considering what has been so very beneficial to his son.